WEST JAVA ESCAPADES: KAMPUNG SAMPIREUN Duration: 4D-3N Blackout Dates: 27 June – 17 July 2016 (Idul Fitri) Complete your holiday with the relaxing natural escapades to a hidden sanctuary in West Java. For those who are anti-mainstream, we bring you the least travelled selection of Java tour. 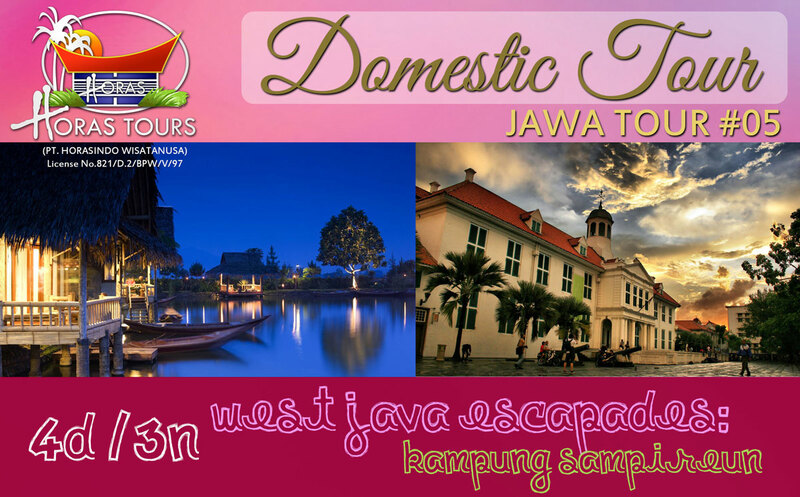 See the different part of Java island through the Old Batavia town and harbour, Bogor Botanical Garden, Puncak highland, and Kampung Sampireun haven that are nothing less than original and extraordinary! DAY 1: BATAVIA CULTURE & BOTANICAL GARDEN TOUR Jakarta – Bandung Upon arrival to Jakarta airport, our guide will welcome and guide you to visit Old Batavia – a colonial Dutch town marked with Dutch-architecture buildings. Then, drive to the old harbour Sunda Kelapa to watch the traditional wooden schooners, with a mile-long wharf used since 1817. Afterwards, we take the highway to Bogor and stop by The Botanical Garden of Bogor, known as the Live Museum of Tropical Plants that contains 5,000 species of plants. En route to your hotel in Bandung, we’ll take the gorgeous Puncak highland road passing through beautiful tea plantations and hilly scenery. Check in and free activities at your own time. DAY 2: WELCOME TO KAMPUNG SAMPIREUN Bandung – Garut: Kampung Sampireun Have an early breakfast and get ready for 8am pickup to continue our trip to Garut. We’ll stop by at Cangkuang Temple, a small 8th Century Hindu Temple and hear the fascinating history behind the temple and the ancient Islamic tomb located few steps away. After a quick cultural stop-by, we’ll transfer you to the ultimate treat of your tour: Kampung Sampireun Resort & Spa. As you enter the compound, be wow-ed by the stunning lake view and see the canoes parked by the water to take you to your bungalows. If you prefer a garden view room, you can take the long scenic way around the lake and enjoy the lush greeneries. Don’t miss out on exclusive floating candlelight dinner on the lake if you bring your partner! Enjoy the rest of the day at leisure. DAY 3: HALF-DAY GARUT CITY TOUR Garut After breakfast, enjoy your morning on your own activities. Take a swim or relax by the hotel until lunch time. Afternoon, we’ll pick you up to see Orok (baby) Waterfall in Cikajang, passing by the delightful tea plantation. Then, we’ll take you to the heart of Garut to check out the city’s famous home industry production such as Leather factory in Sukaregang village, Batik Garutan Factory & Akar Wangi (Vetiver) home industry. Return for last night at the hotel. DAY 4: SEE YOU AGAIN Garut - Jakarta After breakfast and check out, we will transfer you to Jakarta via highway and transport you to the airport or hotel of your choice.